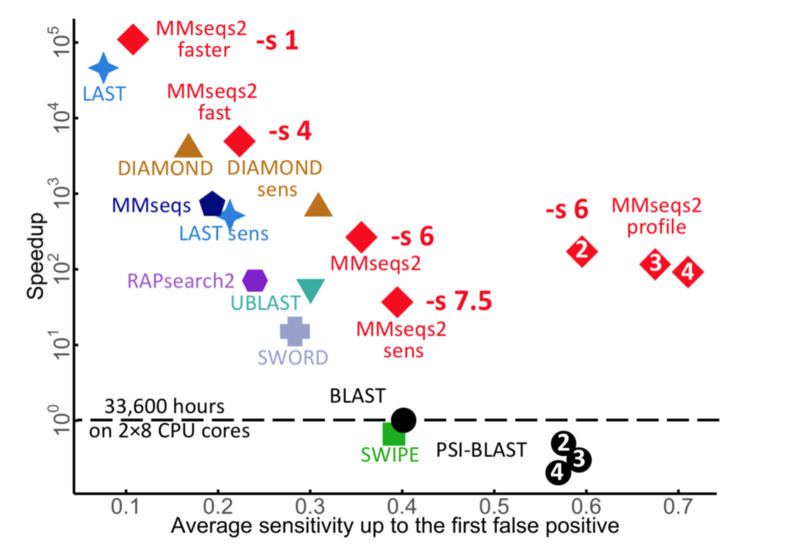 The average AUC sensitivity versus speed-up factor relative to BLAST for 637,000 test searches. The sensitivity is called area under the curve (AUC). MMseqs can be installed by compiling the binary from source, download a statically compiled version, using Homebrew or Docker. parallelized protein sequence searches and clustering of huge protein sequence data sets. Please cite: M. Steinegger and J. Soding. MMseqs2 enables sensitive protein sequence searching for the analysis of massive data sets. Nature Biotechnology, doi:10.1038/nbt.3988 (2017). easy-linclust Compute clustering of a fasta database in linear time. The workflow outputs the representative sequences, a cluster tsv and a fasta-like format containing all sequences. easy-cluster Compute clustering of a fasta database. The workflow outputs the representative sequences, a cluster tsv and a fasta-like format containing all sequences. map Fast ungapped mapping of query sequences to target sequences. taxonomy Compute taxonomy and lowest common ancestor for each sequence. lca Compute the lowest common ancestor from a set of taxa. An extended list of all tools can be obtained by calling 'mmseqs -h'. Bash completion for tools and parameters can be installed by adding "source MMSEQS_HOME/util/bash-completion.sh" to your "$HOME/.bash_profile". Include the location of the MMseqs2 binary is in your "$PATH" environment variable. converts a protein sequence flat/gzipped FASTA or FASTQ file to the MMseqs sequence DB format. This format is needed as input to mmseqs search, cluster and many other tools. Searches with the sequences or profiles query DB through the target sequence DB by running the prefilter tool and the align tool for Smith-Waterman alignment. For each query a results file with sequence matches is written as entry into a database of search results (alignmentDB). In iterative profile search mode, the detected sequences satisfying user-specified criteria are aligned to the query MSA, and the resulting query profile is used for the next search iteration. Iterative profile searches are usually much more sensitive than (and at least as sensitive as) searches with single query sequences. --split 0 Splits input sets into N equally distributed chunks. The default value sets the best split automatically. createindex can only be used with split 1. --split-memory-limit 0 Maximum system memory in megabyte that one split may use. Defaults (0) to all available system memory. --sens-steps 1 Search steps performed from --start-sense and -s.
--slice-search false For bigger profile DB, run iteratively the search by greedily swapping the search results. MMseqs software suite for fast and deep clustering and searching of large protein sequence sets. Nat Commun. 2018; 9: 2542.